While proper foot care is important for everybody, senior citizens have the tendency to be more susceptible to certain conditions. The elderly should therefore be well-informed about podiatric problems that may arise and what they can do to properly avoid or treat them. Some of the most common problems are foot ulcers, ingrown toenails, fallen arches, and fungal infections. A foot ulcer is an open sore on the foot and can be a result of decreased sensation in the feet due to diabetes. An ingrown toenail is defined as when the nail grows into the side of the toe. Fallen arches are indicated by the instep of the foot collapsing. A fungal infection is a condition that results in deformed and discolored toenails. 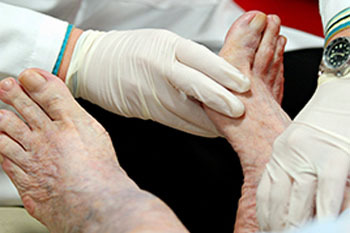 In order to avoid these conditions, it is recommended that the feet be inspected by the patient on a regular basis. If these inspections are carried out routinely, there is a good likelihood that problems can be identified before they become severe, or can even be avoided altogether. If any abnormality is discovered, it is important that the individual consults his or her podiatrist for a diagnosis and information on treatment options. Proper foot hygiene is also important. Making sure that you always have clean, dry socks on can be a major deterrent to many different problems, including bacterial infections, foot odor, and certain types of fungus. Wet feet are a major cause of many of these problems. If your socks get wet, it is important to change them. Walking around in wet socks may not only lead to various infections, but can irritate the skin and result in a number of various complications. Clean, dry feet are less likely to be affected by fungal and other infections. As people age, the fat present on the feet begins to deteriorate. The protective nature of this fat keeps the feet healthy by providing a barrier between your bones and the ground as well as giving the skin on the foot a certain amount of elasticity. This is one factor that causes elderly people to develop foot issues. Foot moisturizers can be helpful to avoid certain problems associated with this. Certain medical conditions, such as diabetes or poor blood circulation, increase the risk for foot issues. For individuals with any of these conditions, it is extremely important to conduct regular foot inspections to make sure that there are no sores or infections present.